prequel comic to the smash-hit fighting game, Injustice: Gods Among Us! Superman's greatest threat - Batman! 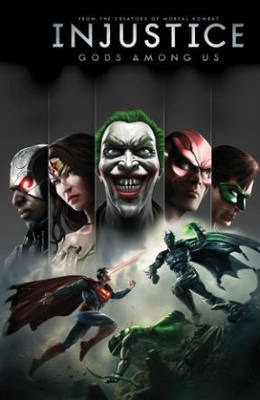 Collects #1-5 of Injustice: Gods Among Us. TOM TAYLOR is the creator of the Aurealis-Award Winning graphic novel series THE DEEP (which tells the adventures of a multiethnic family of underwater explorers who live on a submarine). The Deep has been optioned by Technicolor to be turned into a 26 episode CG animated series. He is perhaps best known for the best-selling DC Comics series, INJUSTICE: GODS AMONG US, and his many Star Wars series, which include STAR WARS: INVASION and STAR WARS: BLOOD TIES (which won the 2012 Stan Lee Excelsior Award). Taylor has written for DC Comics, Dark Horse Comics, IDW Publishing, Wildstorm, 2000 A.D. and Gestalt Comics.